Multitasking moms are in for some serious pampering. 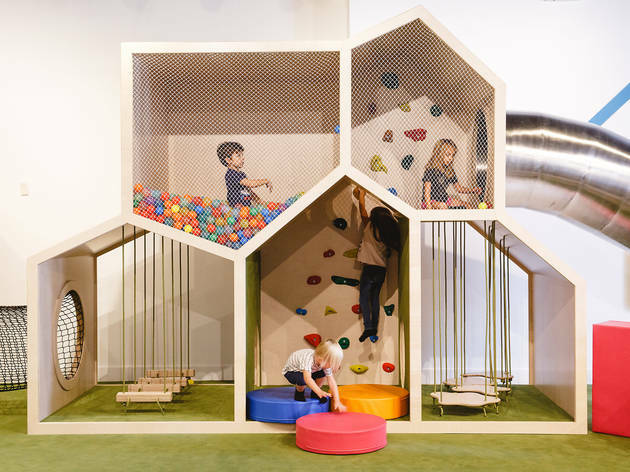 POD 22 is Florida’s first indoor playground and nail spa. The brains behind the glossy new operation is Virginia Aguirrebeitia, a busy Miami Shores Village mom whose digits and viable day-care options were in distress. “During the week, I traveled extensively for my corporate job, and on weekends I attended birthday parties for my kids’ friends. I had no time to relax without constantly feeling guilty about having to leave my children,” says Aguirrebeitia, who channeled her anxiety into creating a place where kids and parents could go together but also spend time apart—so Mommy can get a manicure while her kiddo climbs rocks nearby. POD 22 has ball pits, swings, nets and structures for children to scale under staff supervision. Parents can rest assured that their little ones are safely engaged in active play while they treat themselves to a luxurious mani at the spa in the back or a cup of tea in the lounge. Pinkies up! To get a BOGO deal on supervised playtime POD 22 click here. Jackie Gutierrez-Jones is a freelance editor and writer based out of Miami, FL who covers food, drink, travel and parenting. When she’s not putting digital ink to paper, you can find her picking up absurdly heavy weights in a CrossFit box or giggling with her toddler. Follow her on Twitter at @jaxiscool.